User Feedback suggests users like to type in a traditional keyboard format and avoid the slow response of the hunt and peck method with the standard Fire Stick Remote. The iPazzPort Fire Stick keyboard is the ONLY keyboard on the market designed to provide the solution. It provides a fully wireless QWERTY keyboard with a sleeve custom made to hold both the iPazzPort and the Fire Stick Remote(Support Voice or Standard Remote). On YouTube Search,YouTube onscreen keyboard only support Arrow keys and the Enter key function to navigate,not allowing input;The Backspace key acts like a return key and takes to the previous page; The same issue with other keyboards. The size is portable and handheld at only 6"x2"x.5" and weighs only 3 oz. Bluetooth wireless connection range up to 30 ft.
Powered by AAA batteries (not included). 2. Using fire stick remote to the "setting" / "Controllers and Bluetooth Devices" / "Other Bluetooth Devices", click "add bluetooth device" and would find "iPazzPort Bluetooth", connect it. After connected, keyboard would work soon. It includes the iPazzPort keyboard and silicone sleeve that HOLDS YOUR EXISTING AMAZON REMOTE. The iPazzPort for Amazon Fire TV Cube and Fire Stick allows you to easily enter text for searches in a traditional type writer layout. No need to hunt and peck with the Amazon remote. 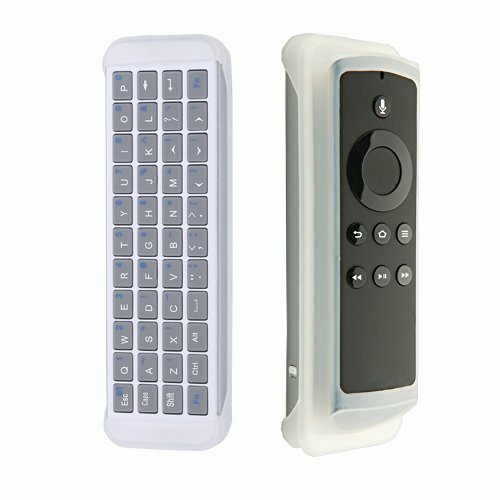 The included silicone sleeve allows you to combine the iPazzPort and the Amazon remote into a single unit. Keep both together for ease of use...and no more losing remote controls! The sleeve fits the Fire Stick standard and voice remote.Note:it can not work with fire tv 1st and 2nd generation, work for Fire TV 4K .